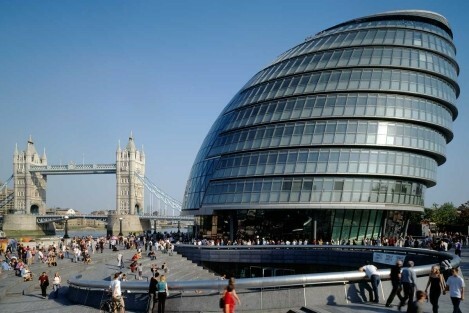 City Hall was designed by Foster and Partners, one of Britain’s leading architects. 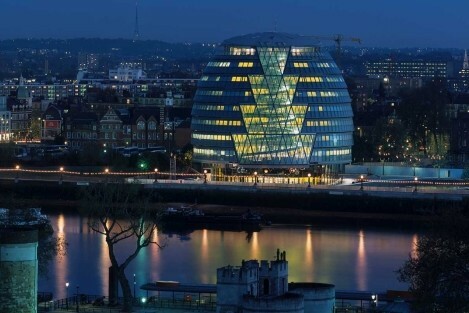 His home to the Mayor of London and the GLA, who in July 2002 became tenants of this striking rounded glass building on the south bank of the Thames near Tower Bridge. 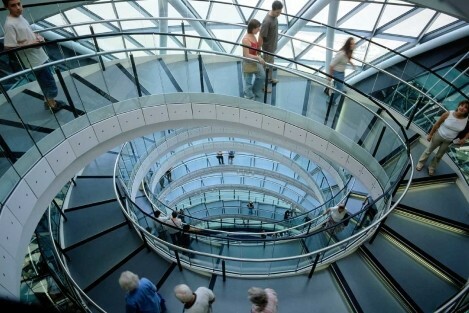 The goal of the analysis was to determine the vibration behaviour of the spiral staircase, which stretches from the first to the eight floors in the new London Authority. The system consists of a boxed steel-cross-section, spiral-shaped with always smaller diameter reaching the top of the building. It is fixed to each floor, and in areas with big spans there are additional tension members. The first step was to determine the natural frequency of the entire ramp, modelled with a three-dimensional space frame. The calculated frequency was looked at to asses the performance capability of the ramp regarding the occurring oscillation. To verify these calculations we measured the natural frequency of a Mock-up of the ramp and found good correspondence, between the calculated 6.8Hz and the calculated 7.3Hz.